Matt Jansen insists his Chorley side won’t be taking minnows Whitley Bay lightly in the FA Cup third qualifying round. Jansen has previously stated that he wants a run in the FA Cup. 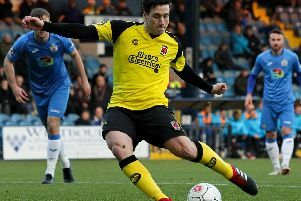 But the Chorley chief pointed to Whitley’s impressive form which has seen them go on an eight-match unbeaten run and he feels his side must be at their best come the weekend. “We can’t take anything for granted, it is a tough league over that way,” Jansen said. “They’ve beaten the likes of Matlock Town and they are unbeaten at home. “We cannot take them lightly, they will be up for it, it’s a cup final for them and it’s a massive pay day for them. Last time out, Chorley were held to a 2-2 draw against National League North table-toppers Solihull Moors. Despite falling behind early, Chorley took advantage of 10-man Solihull to lead 2-1. But Marcus Bignot’s men equalised midway through the second half to seal a deserved point at Victory Park. “At 1-0 down after two minutes, I’d have taken a 2-2 draw. Elsewhere, Harry Winter has joined Ashton United on dual registration whilst Sam Sheridan has been told he can look for another club.